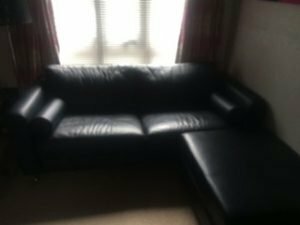 House Clearance Galashiels: Hi Irving we need to clear the contents of a house in Galashiels in the Scottish Borders which is a 2 bedroom, 2 storey property including white goods, a cooker, furniture, bed, TVs and we have about half a garage full of house contents to dispose of plus 4 bed bases and 2 sideboards. There are also two sheds and greenhouses to be cleared. We also need all the capets and underlay uplifted as the property belongs to the local council. I would be grateful if you could please confirm a quote for this work and terms and conditions etc. 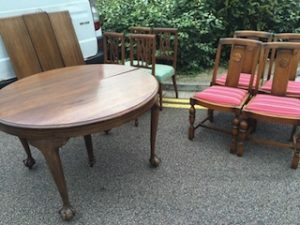 The house clearance was completed on behalf of the customer and the following items pictured below were removed from the property and donated to various charities. Our house clearance staff transported the non reusable items from the house clearance to a waste recycling centre. Please take a moment to read our house clearance faqs and our genuine customer comments. A vintage solid wood extendable circular dining table, together with four solid wood dining chairs, upholstered to the seats in striped patterned fabric. 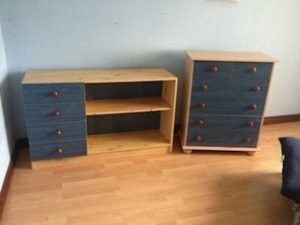 A blue wood television unit, having four drawers aside two shelves, together with a matching chest of drawers. 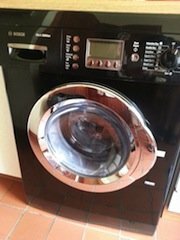 A black and chrome gloss effect, under counter Bosch washing machine. A two seater high back sofa and matching attachment, upholstered in black faux leather. 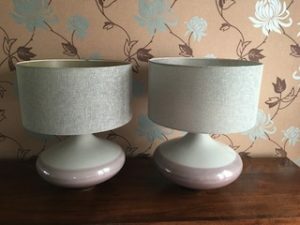 A pair of ceramic bulbous table lamps, each having a metallic silver lampshade. 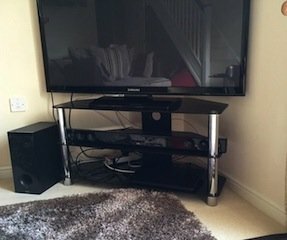 A black glass and chrome three shelf television unit, together with a black flat screen Samsung TV. 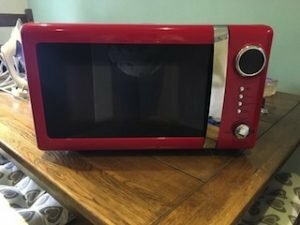 A red and chrome 1.5 litre microwave oven. 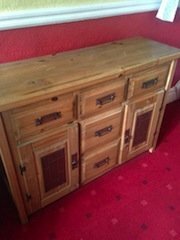 A large solid pine sideboard, having three drawers above two drawers and two cupboards. 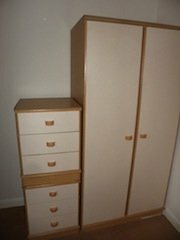 A white double door tall standing wardrobe, together with a pair of matching bedside drawers. 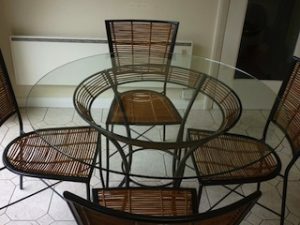 A circular glass topped dining table on an iron and wicker stand, together with four matching curved back dining chairs. 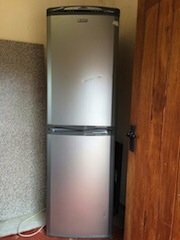 A tall standing two door, silver Hotpoint fridge freezer. 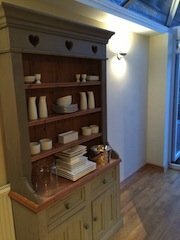 A tall solid pine shabby chic kitchen dresser, having three shelves above a counter top, two drawers and a double cupboard. 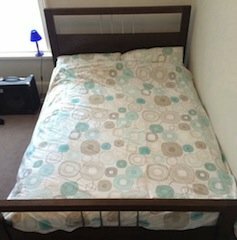 A dark wood and stainless steel double bed, together with a double mattress. 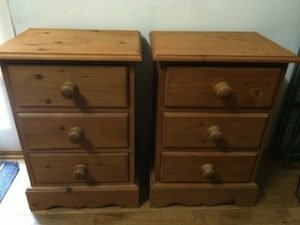 A pair of solid oak scalloped edge bedside chests, each having three drawers with circular knobs. 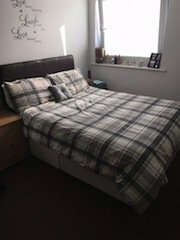 A double divan bed base on castors, together with a double mattress and a faux leather headboard. 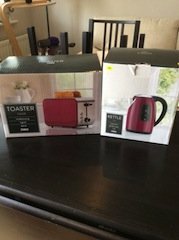 A brand new boxed red and chrome two slice toaster, together with a brand new matching kettle.